While LinkedIn has long been popular with tech industry analysts in Asia/Pacific for some types of social media engagement, it has recently bypassed Twitter as the preferred platform for just about everything, as analysts focus more on how effective each platform is for engaging with their specific audiences. It’s not to say that analysts have fallen out of love with Twitter – that’s certainly not the case – but it seems that they are less infatuated than they were. They are spending more time with their old flame, LinkedIn, and their new dalliance – a little surprisingly – is YouTube. Why this has happened makes for some interesting discussion, and I’ll get to that a little further on. For the past 10 years, Intelligen has conducted a survey of industry analysts in APJ, primarily focused on analyst perceptions of specific vendor AR programs, but also exploring analyst preferences and attitudes on a range of issues. The most recent iteration of our Understanding the Influencers study was conducted in late 2012, and yielded responses from 132 analysts at 19 firms in 10 countries, overlaid with 20 in-depth qualitative interviews with senior analysts. 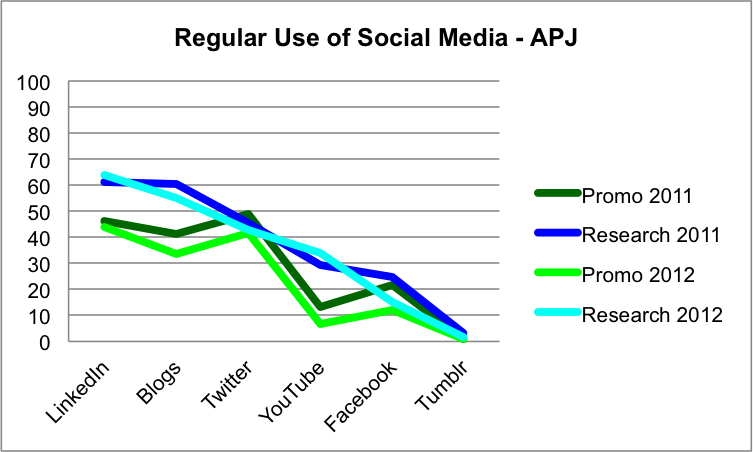 For the past two years, we’ve asked some specific questions about analyst use of social media, so we now have some comparative data to analyse. In short, we asked analysts to tell us whether they use key social media platforms for research and promotion “often”, “sometimes”, “rarely” or “never”. For simplicity’s sake, we equate the aggregate of “often” and “sometimes” to “regular” usage. From a research perspective, analysts are using LinkedIn to search for subject matter experts (both users & vendors) and raise questions about user experiences in the many discussion groups; posting questions and testing hypotheses on Twitter; reading vendor and commentator blogs to gain insight into product and technology directions; watching YouTube videos to update on products, technologies and strategies; and many other ways of gathering information. From a promotion perspective, analysts are posting links to research and events on Twitter and LinkedIn; earnestly expanding their networks on LinkedIn; building their personal brands through ongoing “news” commentary on Twitter; writing blogs which detail their research and/or opinions; and many other ways of raising their profile and building awareness of their capabilities. The 2011 results were discussed in detail in this blog post, but in summary what we found was interesting and relatively unsurprising, confirming what we knew anecdotally. 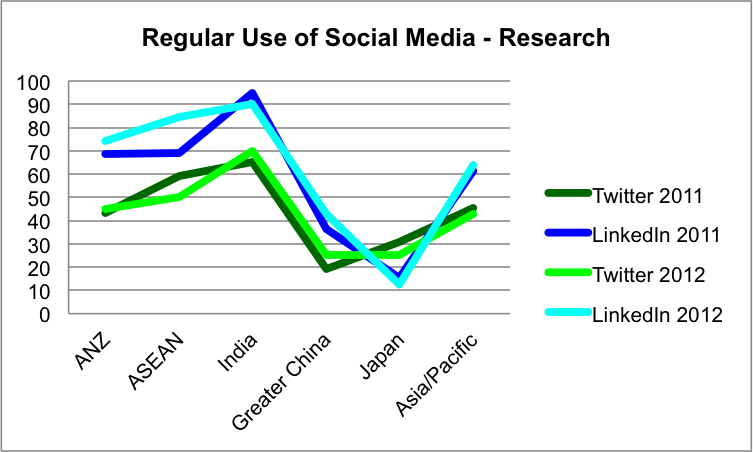 Nearly all analysts were using some form of social media, but fewer of them were using SM “regularly”, with analysts in India the greatest proponents. For research, analysts preferred LinkedIn & blogs over Twitter, while for promotion, analysts preferred Twitter over LinkedIn. When we compare the 2012 results with 2011, we can see that the usage patterns are fairly similar, whether we view them from a geographic or platform perspective. As there was a significant correlation between the response sample in both years, this gives us confidence that the differences are fairly real, not a result of sample differences. In the case of the research results, there is a very strong correlation between 2011 and 2012, with a couple of minor variances. What is interesting is that the percentage of analysts using LinkedIn for research has increased slightly, while use of blogs & Twitter dropped at a similar rate, and use of YouTube increased sharply (although the volumes are lower). From a promotion perspective, use of LinkedIn decreased slightly, but the decline in use of Twitter and blogs was much greater, meaning that more analysts are now using LinkedIn for promotion than Twitter. LinkedIn is the preferred platform for promotion in India and Greater China, while analysts in Australia use both LinkedIn & Twitter equally, and ASEAN analysts still have a slight preference for Twitter. So not only is LinkedIn the preferred platform among APJ analysts for both research and promotion, but Twitter is now used by more analysts for research than for promotion. The delta between research and promotion use has grown – analysts are now more focused on gathering information via social media than just pushing out their opinions. There is a strong likelihood that LinkedIn’s decision to stop supporting Twitter last year has changed analyst behaviour – analysts who were previously posting to LinkedIn via their Twitter accounts are now using LinkedIn as a primary platform, often pushing updates out to Twitter. But many analysts are still using these platforms separately. What has taken place over the past couple of years is a better understanding among analysts of these platforms, and which ones yield the best results – and it has a lot to do with audience. For analysts, Twitter undoubtedly has many benefits. It is quick, it is real-time, and through the use of hashtags, retweets & searches it allows analysts to reach people they couldn’t otherwise even identify. But engagement is relatively casual & ill-defined, and there continue to be doubts about how influential it is in enterprise B2B purchasing decisions – this post from Influencer Marketing Review last week provides some interesting insights into how sheer volume of tweets has a very limited relationship with influence over enterprise software buyers. LinkedIn is more “formal”, but it has the advantage of a known audience. LinkedIn members have detailed public profiles which allow analysts to determine how relevant they are to their research areas (and assess credibility), connections are made in a more structured way, and discussion groups bring like-minded individuals together in generally more substantial conversations. Both platforms have something to offer analysts and will continue to do so, but it’s hard to see how LinkedIn will not remain the partner of choice. Analysts are focused on depth, detail, specifics & context, and that’s what they get through LinkedIn. But analysts are also opportunistic and self-promoters, so they’re not going to walk away from Twitter any time soon. Personally, I find the increased uptake of YouTube just as interesting. Once upon a time, you could never have engaged the analyst community with video, but the fact is that they are watching more, and YouTube is an extremely simple & accessible platform. Done well, done smart & done in moderation, it has a lot to offer. What does this mean for AR? While we’ve seen changes in how analysts are using social media, the fundamentals from an AR perspective haven’t changed. When I wrote about this topic last year, I provided this advice to AR professionals, and I think the guidelines are pretty much the same. I’ve relied on both quantitative data and qualitative feedback to draw my conclusions, but what do you think? Social media is still an evolving area, so I’d be really interested to hear experiences from AR pros & analysts alike, plus answer any questions. Let me know – you know how to do it! Thanks for this. From my singular perspective, Linkedin has become much more of an important source of audience for me in the last 12 months. There is not a lot of difference between the source of audience, Twitter vs Linkedin, but I am more confident that Linkedin is a more informed and interested reader. To be honest, nothing works picking up a phone as a source of direct reach, albeit a little more inefficient than the social media tools. You’re right, Phil, old-fashioned communication processes still have a role! As always, it’s about finding the right mix, but it’s interesting watching this mix evolve. Hi Dave, I use LinkedIn daily and Twitter rarely … but my LinkedIn posts are copied to Twitter. I find LinkedIn very useful professionally as both a ‘broadcast’ tool and also as a catalyst for one-one interactions and banter back and forth about the issues of the day etc. I often receive inbound communications from folks that have found out about me or my work from my LinkedIn profile or from interactions on LinkedIn. Thanks for the great insight. This is the type of usage model I’ve been hearing about, so it’s great to get some more ‘colour’ around how analysts are actually using these platforms on a daily basis.